The chart shows the results of a subset of low-vision students after 8 hours of video training, and the sustained visual benefits after a 12-month post-training follow-up. A new study by vision scientists at the University of Rochester and Vanderbilt University found that children with poor vision see vast improvement in their peripheral vision after only eight hours of training via kid-friendly video games. Most surprising to the scientists was the range of visual gains the children made, and that the gains were quickly acquired and stable when tested a year later. "Children who have profound visual deficits often expend a disproportionate amount of effort trying to see straight ahead, and as a consequence they neglect their peripheral vision," said Duje Tadin, associate professor of brain and cognitive sciences at Rochester. "This is problematic because visual periphery -- which plays a critical role in mobility and other key visual functions -- is often less affected by visual impairments. "We know that action video games (AVG) can improve visual perception, so we isolated the AVG components that we thought would have the strongest effect on perception and devised a kid-friendly game that compels players to pay attention to the entire visual field, not just where their vision is most impaired," said Tadin, who is also a professor in the Center for Visual Science. "As a result, we've seen up to 50 percent improvement in visual perception tasks." Successful AVG players distribute and switch their attention across a wide area, while at the same time they remain vigilant for unexpected moving targets to appear, all while ignoring irrelevant stimuli. The researchers created a training game with these specific task characteristics while eliminating other components of AVGs, such as the demand for speeded hand-eye coordination, and any violent or other non-child-friendly material. Twenty-four low-vision youths from the Tennessee and Oklahoma Schools For The Blind participated in the training experiment that appears in Scientific Reports. Pre-training screening showed that while most children had central visual acuity worse than the 20/200 legal blindness limit, they also underutilized their peripheral vision. According to the study's lead author, Jeffrey Nyquist, founder and CEO of NeuroTrainer, the students' issues with the periphery were in part attentional. 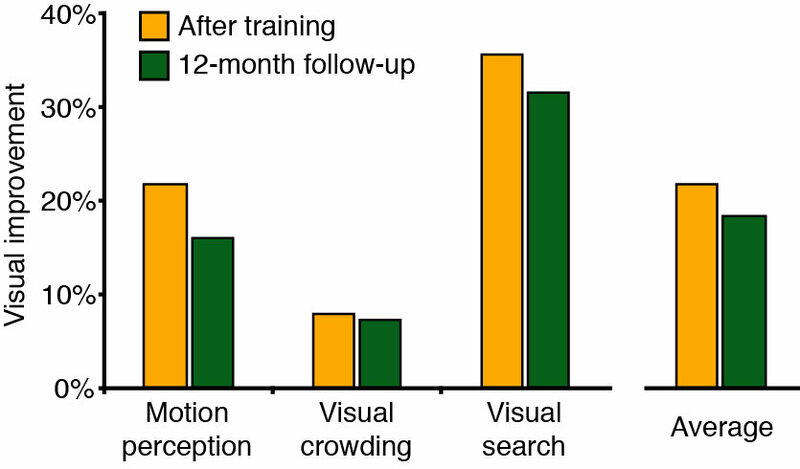 Nyquist and the team hypothesized that training the students to pay more attention to their peripheral visual field could have quick results. "We didn't improve the kids' hardware -- these children have profound physical problems with their optics, muscles, and retina, and we can't fix that," said Nyquist. "But we could improve their software by training their brain to reallocate attentional resources to make better use of their periphery vision." The students were divided into 3 groups: a control group that played a Tetris-like game; a group that played a kid-friendly commercially-available AVG, Ratchet & Clank; and a group that used the training game devised by the researchers. All games were played on a large projection screen to better involve visual periphery. The game the researchers developed has a dual-task component. Students tracked multiple moving objects simultaneously while being on the lookout for another object that briefly appears and requires a response from the player. "The goal is to pay attention to a number of objects over a large area, and to be prepared to react to unexpected events in the even further periphery," explained Tadin. "It forces the low-vision students to expand their visual field -- to shift their attention to the neglected areas of the visual field." After a total of eight hours of training, groups who trained with the commercially-available AVG and the custom dual-task game showed significant visual improvements. Improvements were seen in a range of visual tasks. The students were able to better perceive moving objects (motion perception) in the far periphery, they were able to better attend to visual crowding, such as identifying a specific letter within a field of other letters, and they were much faster at finding objects in cluttered scenes (visual search), like finding a stapler on a messy desk. "We were surprised by the range of improvements, and we were even more surprised when we tested a few of the students a year later and found that the gains they made were stable," said Nyquist. "Within just a few hours of training, they were able to expand their usable visual field and visual search ability." Nyquist notes that when the researchers began their work with the students, it was to assess how they maneuver around their environments. "But we quickly went from assessing to thinking 'maybe we have something that can train them and improve their real-life abilities,'" he said. "When we realized that the students achieved up to 50 percent improvement in visual tasks, we were blown away."